Are you a smart, single woman over 60 who still feels fabulous? Or do you feel absolutely well past your use by date? Are you a quitter, or do you think you deserve to live a life full of energy, inspiration and fulfilment? This book is a celebration of smart, single women over 60 and the many roles they play over their lifetime. But wait, by what criteria can you be deemed smart? That’s easy … you deem yourself as smart, no outside authority is needed, is it? Actually, for many baby boomers, outside authority is needed. Someone else’s approval is necessary. That’s a major reason for writing this book. I think we’re grown up now; I believe we can grant approval to ourselves, to choose how to live our own lives, can’t we? People often make harsh statements about older people, but if we are past our use-by-date, who sets that date; who pulls those strings? It turns out that control starts at the very beginning: a baby girl is born into a pink world with the road map of her life’s journey already in place. This road map has been determined by her pa﻿﻿rents and by society and if she doesn’t follow the route marked within she may pay a high and sometimes extremely harsh price. Isn't it time we broke free? After a long life of habitual behaviour and ingrained responses, can women over 60 make those necessary changes? I absolutely believe they can, but only if they want to, only if they believe they can. 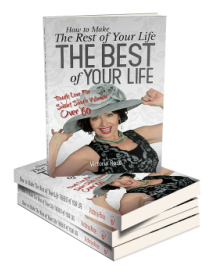 How to Make The Rest of Your Life The Best of Your Life gives smart, single women over 60 a road map to a destination of their own choosing. In Australia there will be more 60th birthdays this year than ever before. In six short years, one in five will be aged over 60. We are a powerful group with a strong voice. We can stand up and speak, each in our own way, because we can make a difference. Indeed, it is our moral duty to make that difference.